I could just call these macaroons, but there are so many varieties of macaroon (not to be confused with the French cookie, macaron) that I thought I best specify especially as there is another kind of macaroon, the Italian amaretti, which is made with almonds, meringue, and traditionally sugar that I wish to make eventually and blog about. I already have a recipe for it, so that should be coming hopefully soon. Look out for it! The macaroons can be made by forming individual mounds on a baking sheet lined with parchment paper or filling paper cupcake liners half full. A general rule of thumb: the total amount of macaroons made depends on how much batter you use per macaroon (I suggest 1 tablespoon in the instructions) or the size of the paper cups that are filled. This is only one of several recipes that is a great way to use up any egg whites that may be leftover from other recipes, such as ones that call for only egg yolks. With this in mind, you may double or triple the recipe as required or as needed. When whipping egg whites, make sure the appliance you are using is absolutely dry, no moisture left whatsoever. Also make sure that there isn’t any egg yolk in the whites. These factors are important to observe so that the egg whites stiffen and form peaks properly when stiffened. Once stiff, the egg whites must be used immediately or they will weep as there isn’t any binder, such as cream of tartar, used to prevent this. 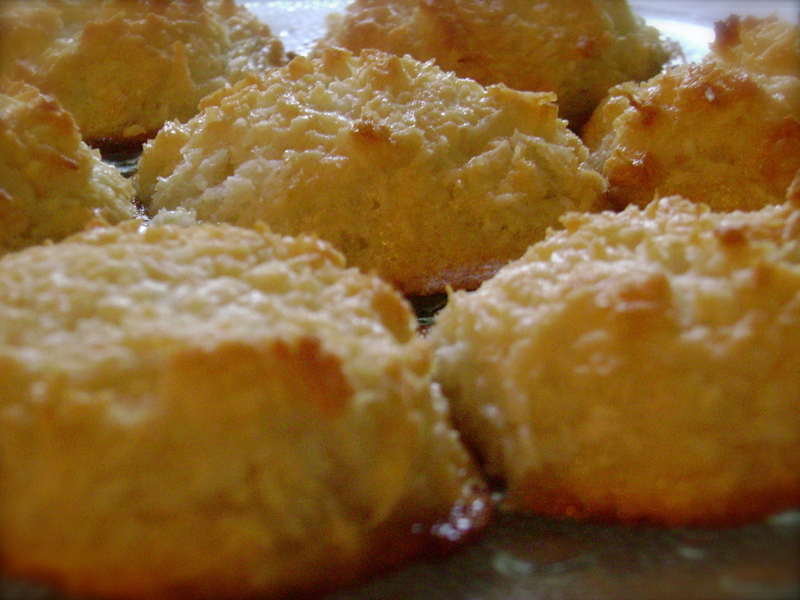 If the macaroons aren’t sweet enough to your liking, you may increase the honey to half a cup. Preheat oven to 350ºF. Whip the egg whites until stiff and form peaks; you may add a pinch of salt to help with this process. Add honey slowly, beating constantly – when the honey is added, the egg whites may lose some of their stiffness, just make sure they don’t start weeping. Gently fold in the coconut flakes and currants or raisins, if using, until fully incorporated. Form individual mounds (about 1 tablespoon) on a baking sheet lined with parchment paper, or fill paper cupcake liners half full with batter. Bake 15 minutes, or until tops are golden brown. Cool before serving. Enjoy! Click here to download pdf of recipe. I tried these today (with the odd adjustment for what I had in stock), and they tasted fabulous. My only problem was that they didn’t hold together quite as well as the ones in your picture, but it’s not a big deal since I baked them in muffin holders. These also taste great with flax seed and sliced almonds instead of raisins, and a teaspoon of vanilla extract, by the way. If you mean to add chocolate chips to the macaroons, go ahead! It would work and I’m sure it would taste great. If you’re meaning to make these as meringues, however, and you’re wanting them to be crunchy, I don’t know how well it would work since macaroons (not to be confused with the French macarons) and meringues are two different cookies. I made these for my husbad and split the batch to experiment a little. I didn’t have any raisins or currents so I made halp plain and for the other half added in some finely-chopped fresh pineapple. Both versions turned out great but my husband really liked the pineapple version!.